Dense Words: How do I write a story? I have a fetish for character creation. Each time I get a cool idea for a new character I go about creating and establishing them. Sometimes my character establishment is much better than the story that it is in. There are a couple of examples here. The other problem is that I find it all too easy to set up a dramatic event: let's say a sudden confrontation between two characters; the discovery of an accident; a surprise arrival of an unexpected guest. I think of scenes like those very easily and I can write them with as much drama and emotion as is necessary. In my bad stories, I've started with a series of events like those, established some cool characters, and then tried to build a story around them. I don't know how common this is. But I do know that for me, this doesn't result in a good story. I hope that was fairly obvious. The shape of the story came to me before the story itself, but ended up dictating not just the fatal path of the main character, but also his physical path and the path of the arrow of time. Not all story shapes are so simple. Sometimes they feel as detailed as landscapes; sometimes they seem like polyhedra - though seldom regular. Once I have a satisfying shape, I can start looking for the people and events that are triggered by the shape, or that fit into it. Sometimes it's Euclidean, and sometimes it really isn't. With some stories I don't even know the genre I'm writing in until I start writing. The classic story shape, the archetype of archetypes, is the Wheel of Fortune. It is a symbol that you find both explicit and implicit all through Shakespeare, for example. 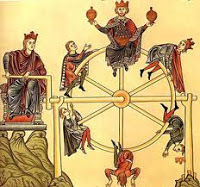 For many hundreds of years the symbolism of the Wheel of Fortune ruled European stories, and for any given story you can mark the start point and end point on the wheel of each character. Those who were on the way up at the start are on the way down by the end; those who were high are brung low; those who were low raised high. In the best WoF stories there is a strong interconnexion between the fortunes of all the characters. Voltaire satirises this simplistic view of storytelling (among other things) in Candide*, where the wheel seems to spin out of control, sometimes in two directions at once. Sometimes it is fun to try to draw the shape that a given story evokes in your mind. Wool, (books 3 through 5 in particular) with its dominant staircase, and its themes of power and responsibility, of stability and precarity**, inevitably is shaped like a shaft, and the position and direction of characters in the shaft symbolises their status, and their progress through the story, almost whether Hugh wants them to or not. I'm not altogether clear on what the conclusion of this essay is. I'm aware that some stories seem to appear in the author's mind fully formed; I'm also aware that when it comes to my own stories, I do the best ones when I get the story first, and the characters, events, locations come after. I also know that I write good stories when writing on demand. When I need a story that illustrates a particular point, anything from philosophy or sociology to spelling and grammar, I can write a strong story. Maybe the conclusion is personal then: that I write good stories when I'm not being self-indulgent. How about you? ** the proper word is the horribly ugly "precariousness". Please promote my alternative.